As the first daughter of the Federal Republic of Nigeria, we know a ton of money went into her wedding ceremony that was filled with opulent decor, florals, luxurious touches on all angles, but looking at Zahra Buhari’s wedding gown, we were completely left awestruck. Without trying too hard, Zahra pulled off a simple yet refined, jaw-dropping look like that of any royal. She didn’t choose a voluminous silhouette or a gown with the longest train, instead, the 21-year-old beauty went for something fit for a princess. Designed by an Abuja-based fashion house, Hudayya Couture, the lacy gown with long sleeves hugged Zahra’s slender figure perfectly and helped accentuate her tiny waist. She top off the look with a matching headwrap, coveted silver heels and a touch of red on her lips which injected wedding-time glamor in full effect. With a look, this good, is it undeniable Zahra had the most stylish and glamorous wedding celebration on record and we’ll definitely be dreaming about it for a long time. As a matter of fact, there’s something more inspiring we learned from this wedding. As the first daughter, all her dresses — from the pre-wedding party, her Kamu to the wedding attire, were made by a Nigerian brand, which is in line with President Buhari’s buy ‘Made in Nigeria’ campaign. Like Zahra herself posted 24hrs ago, ‘I respect tradition, it is what makes us unique. For my kamu I insisted on wearing the rich blue traditional Fulani fabric that was worn by generations before us and @hudayya delivered! Hudayya Couture is a prestigious Nigerian brand situated somewhere in Wuse 2, Abuja. So if you’ve got a big event coming up, we bet you to try them. 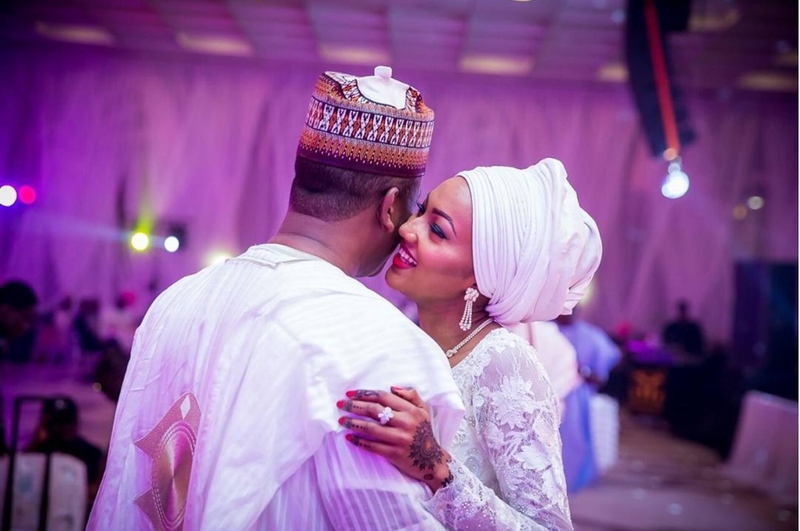 Keep clicking to see Zahra Buhari’s wedding images, shot by Bayo Omoboriowo and Big H Studios.